Maureen T. Corrigan holds a medical degree, a masters in administration and a college fellowship. She began her career as a medical practitioner then moved into management of hospitals, health services and aged care. 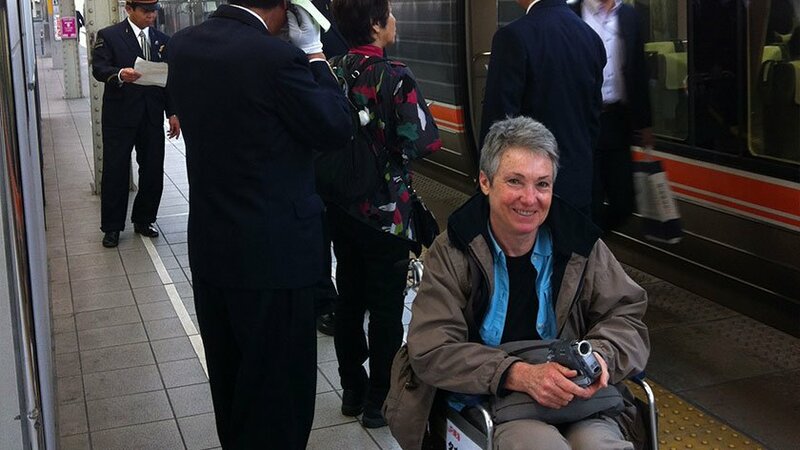 Maureen retired earlier than anticipated because of multiple sclerosis but has taken this time to explore her passions including travel as far as Japan and the Arctic. She wrote a book about her time in the north called Unexpected Rewards: Travelling to the Arctic with a Mobility Scooter – be sure to pick up a copy! I recently returned from an enjoyable holiday in Japan where I used my mobility scooter. It is a country of many innovations but I saw no mobility scooters at all, let alone light easy travelling ones like mine. Having such a novel mobility device, I caused quite a stir in many places. Everyone I met in Japan was very polite, caring and respectful. Everywhere I went was clean, neat, tidy and in order. The food was fantastic and I enjoyed many wonderful meals. I also learned some of the Japanese table manners and a little about the culture. There were rules that everyone seemed to follow – lining up, following instructions, wearing uniforms with white gloves, bowing and handling money only from little trays or envelopes. Everyone wanted to help… but sometimes too much; such as at the railway stations. The railway system was the most accessible I had ever experienced. However I was not permitted to ride my scooter on the platforms or into the train itself. Wheelchairs were allowed but not scooters. As scooters are extremely rare, the railway staff could not see the scooter as being the equivalent of an electric wheelchair. It wasn’t listed in their rules. I had to transfer into a manual wheelchair at the ticket gate and have my scooter loaded onto a trolley. At one time, I had six railway attendants looking after me. Three to either wheel me, clear the way or operate the elevators. Then there was one staff member to get and carry a ramp, one to help me in and out of the wheelchair and one to help another attendant lift the scooter off the trolley (it weighs 25 kilograms). Most of the railway stations were fully accessible with flat paths, ramps and elevators. Most ramps and elevators were clearly marked. There was always someone available offering help and once staff members were aware you were going somewhere, there would always be attendants to meet you outside the train door when you arrived. It was fantastic, but because I was not allowed to ride my scooter we had to book wheelchair assistance. Though, I did sneak quite a few rides at stations and onto trains with my scooter. The funniest moment in Japan with my scooter was in of all places, the National Museum of Emerging Science and Innovation in Tokyo. It is the museum where they showed the latest robots. An attendant came up to me and said I could not ride around the museum on my scooter and that I needed to walk. Our Japanese guide explained that I was on the scooter because I had difficulties walking and I was not riding it for fun. The attendant had never seen anything like my scooter before either. “Do you have these problems in Australia? Do people stop you and not know what it is you are on?” our guide asked. “No,” I said, “they don’t wonder what it is, they just haven’t seen one so small and light and want to know where I bought it”. Our guide felt that many people with mobility problems, especially as they get older, stay at home and do not go out. Some do not travel and do not use many mobility aids. A local disability advocate has asked me to return to give a talk on getting out with my scooter. I went back over to Japan last year to give a talk on travelling with my scooter to a disability group in Fukuoka prefecture. The Luggie scooter supplier came too. He had a brochure with a photo of the scooter on it and it had an approval mark from JR Rail to say the scooter was approved for train travel in Japan. Perhaps showing that might help future travelers with travel scooters such as mine.